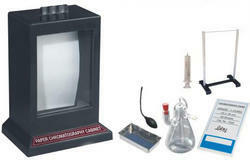 First time in india and in house R & D of complete one year, we, M/s Laby had developed paper Chromatography Kit. 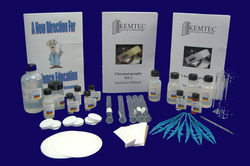 Hence we are the sole manufacturer of Model-PC-10 Paper Chromatography Kit in the world. We have also applied for its patent. It is made of single piece Bakelite moulding. The inner size of cabinet is 6x8x9" with front sliding glass door. The lid of cabinet is also made of Bakelite. It is made of 316 Quality S.S. It is having the volume capacity of 150ml. It is required to hold the solvent mixture.